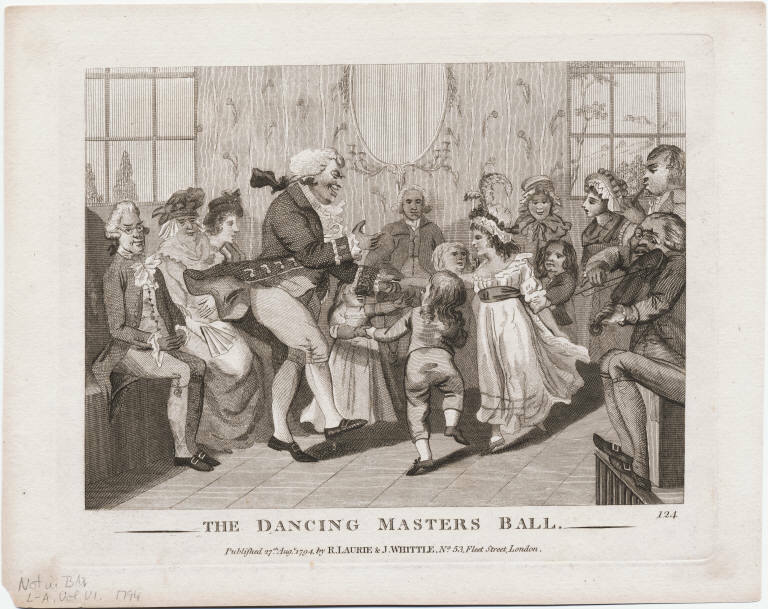 Between 1710 and 1776, at least 27 dance masters taught, hosted balls and performed here in Philadelphia. That’s a good number for a city where Quaker objections to frivolous amusements still had an effect on both legislation and social life. In the early party of the 18th century, most of these dance masters came from England or English-dominated Ireland. Some were schoolteachers who boarded pupils, some were down on their luck gentlemen who came to America for the economic opportunities that England couldn’t afford them, and some were skilled professional dancers who had performed all over Europe. 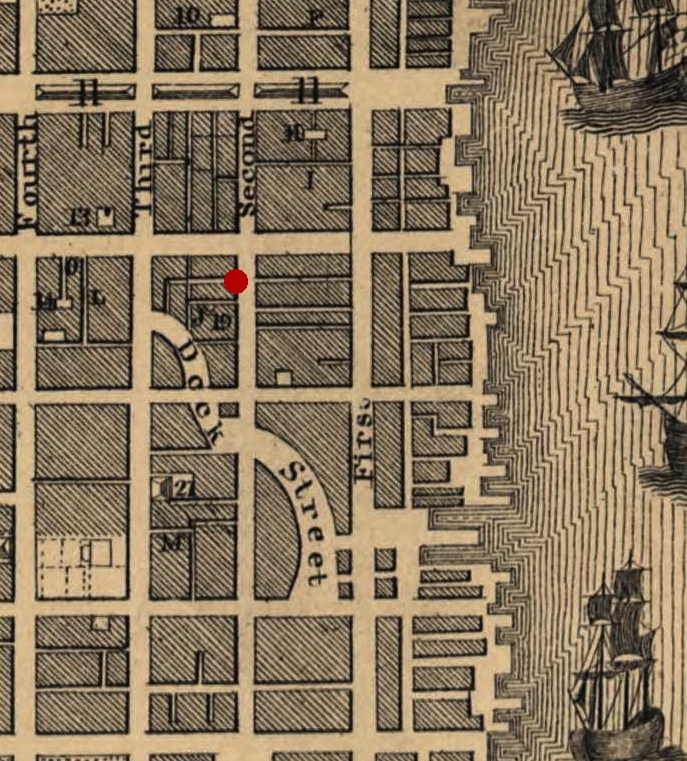 In 1728, just about the time Franklin was beginning to establish himself as a printer here, Brownell and his wife began teaching in Philadelphia at a school room on Second Street near Chestnut, see map, left, where about a half dozen successive Philadelphia dance masters would eventually teach. The 1930s WPA U.S. Custom House stands there today. In this small city of about 10,000, did Franklin know of and perhaps visit his old school master? The Brownells taught there three years, then, in April of 1731, announced that they were leaving for New York. They stayed there a few years, went back to Boston for a short time, then sold their Boston house and returned to Philadelphia in 1736. They remained here until Mrs. Brownell died in 1738 and George left Philadelphia for good. From the mid-1740s he taught in Charleston, until his death in 1750. An interesting part of his legacy in Charleston was his having taught an African-American carpenter named Noko to play the violin. Brownell’s constant moving among the largest American cities; Boston, New York, Philadelphia and Charleston, every few years was not at all unusual for early American dance masters. Many Philadelphia masters taught in the city during the winter, then made the rounds of smaller, rural towns in the summer. They’d rent spaces in schoolhouses, as the Brownells did, or Masonic lodge halls, more easily done if they were Masons themselves. Women are less often mentioned as dance teachers in the 18th century, but it is likely that Mrs. Brownell also taught dancing and music as well as needlework. 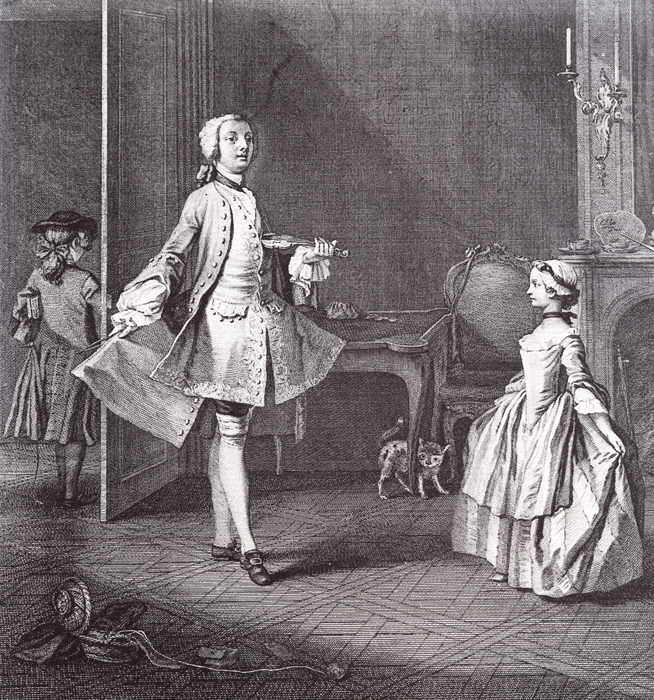 The fact that Brownell, who was primarily an educator, included dancing in his curriculum in each city shows what an integral part dancing was to a genteel 18th century education. Bolton was apprenticed to a rich relative who taught him his business. Unfortunately, he became ill with a lingering consumption and at the age of 21 his physicians concluded that he was beyond recovery. He was at the point of death for almost a year. He was then advised to go to Ireland, when, after a few months some he showed some signs of recovery. Sickly all his life, Robert Bolton struggled to provide for his family. When his attempts at business in Philadelphia failed, he turned to the skills his genteel education had given him and resorted to teaching dance. From newspaper articles like those above, it seemed like the community was ready to support him. Soon after he opened his school, however, he became involved with the evangelical Rev. 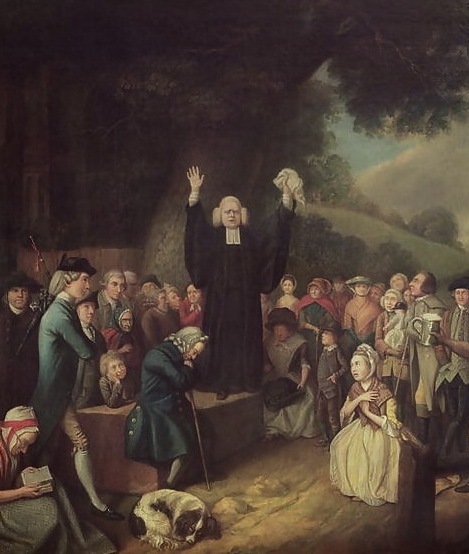 George Whitefield who preached here in Philadelphia against the evils of cursing, drinking and dancing; see illustration, right. In a highly publicized event, Whitefield’s followers shut up the dancing and concert room, claiming they had “saved” sinful Philadelphia. It was later revealed that, in fact, the room had simply been re-opened the next day. Bolton himself, however, was converted to the gospel by Whitefield and gave up “retailing amusements,” so even his dance teaching career was now cut short by his religious convictions. Robert Bolton closed his school and died impoverished in Philadelphia in 1742 at the age of 54.